Not all astronomy observatories need to be on remote mountaintops. Using an all-sky camera—with a wide-angle view that can capture a large area of the sky and up to a thousand photos per night automatically—one can install an observatory anywhere in the world. Peter Teuben, an associate research scientist in the Department of Astronomy at the University of Maryland, installed such a camera in Haiti. Teuben accepted the invitation to the Ecole Supérieure d’Infotronique d’Haïti (ESIH), a higher education institution in Port-au-Prince, Haiti. With funding from the International Astronomical Union Office of Astronomy for Development, he purchased an Oculus all-sky camera and installed the camera at ESIH in 2016. Using photos taken by the camera, Teuben showed a class of ESIH students how to identify celestial objects, such as planets and constellations. Teuben then taught the same students to program in Python so that they could write code for a Raspberry Pi—a miniature computer—to automatically upload the images from the camera to a database at the UMD Observatory. Haiti experiences less light pollution than Maryland, according to Teuben, making the island ideal for observing the night sky. However, Haiti’s infrastructure makes observation with an all-sky camera challenging at times. To give the ESIH students more astronomy-related opportunities, Teuben helped two of them attend a winter workshop hosted by the Graduate Resources for Advancing Diversity with Maryland Astronomy and Physics (GRAD-MAP) program at UMD. There, the students took programming tutorials, carried out astronomy research and observed on radio telescopes at the Green Bank Observatory in West Virginia. But Teuben’s not done—he continues to reach out to students in Haiti with the hope of getting them interested in observing the night sky. “I met another professor based in Haiti, and I’m trying to convince him to install an all-sky camera at his institution and show his students how the stars and planets move,” Teuben said. Teuben found his inspiration to install all-sky cameras in Haiti from Elizabeth Warner, a principal faculty specialist in the UMD Department of Astronomy and director of the UMD Observatory. In spring 2015, Warner proposed installing several all-sky cameras in Maryland to create an all-sky camera network. To raise money to buy the hardware, Warner led a crowdfunding campaign through Launch UMD. The campaign raised enough money to purchase five cameras. That summer, Warner installed an Oculus all-sky camera at the UMD Observatory. The camera has collected almost a terabyte of images and captured stars, airplanes, helicopters and the International Space Station. It has also spotted meteors. Warner also plans to make the photo collection available for other interested researchers. Although Warner has four more all-sky cameras that she plans to install at off-campus locations, controlling the cameras remotely presented a challenge. Joseph Cohen, an aerospace engineering major, is one of those students. His software automatically uploads photos from the camera to the Observatory database and then finds photos containing meteors. 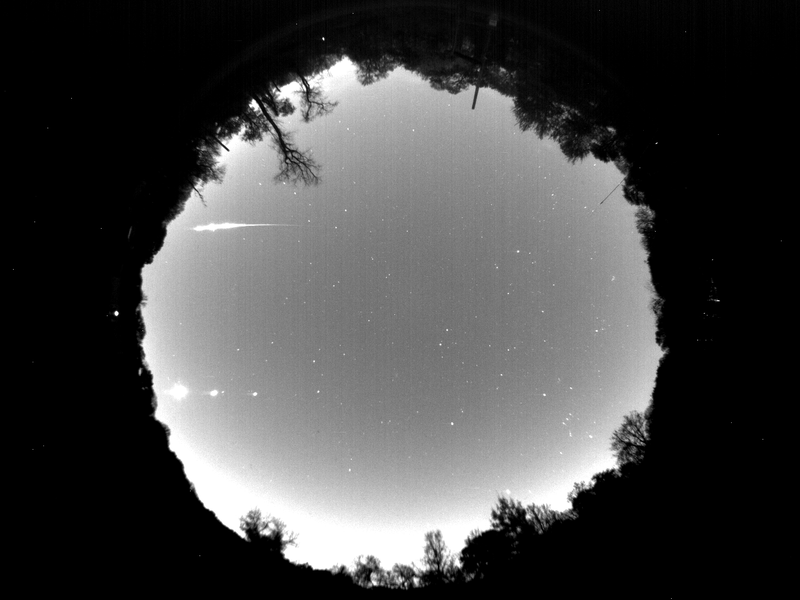 Cohen also wants to automatically upload photos of detected meteors to the Observatory’s webpage. Once the pipeline is complete, Warner looks forward to installing the remaining four cameras at other institutions near College Park.